A friendly Campsite in the heart of Exmoor National Park, at the head of the Doone Valley made famous by Richard Doddridge Blackmore who wrote the novel Lorna Doone. The camp site comprised of level fields beside a shallow stream, set in a valley surrounded by hills and trees, with toilets, hot showers and pot wash. Campfires are allowed, with logs for sale. Not far from the camp site is a licensed café. An ideal campsite to experience the natural beauty of Exmoor all around you, close to Porlock Weir and within easy reach of RHS Garden Rosemoor, Holnicote Estate and the medieval Dunster Castle in the coastal town of Minehead. Rallies and groups are welcome, with two separate camp fields where you can hire the whole field, ideal for clubs, gatherings and/ or a party! 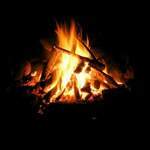 A previous camper said “Great campsite with basic but well looked after facilities, one of few campsites that actually allow campfires - the farmers wife comes around selling logs”. Parking next to your tent. Situated in glorious North Devon, a quiet family run site, surrounded by some of the finest scenery in England. Lynton, Lynmouth and Exmoor and is in a great location for riders to enjoy the superb roads in the area. The North Devon coastline has its own distinctive charm, stretching along the coast from Woolacombe to Westward Ho! there are miles of golden sandy beaches backed by extraordinary dune systems interspersed with dramatic headlands. Nestling beneath the cliffs, the pretty harbour of Lynmouth is a romantic escape from modern day living with its row of fishing cottages tumbling down the street towards the quay and the distinctive Rhenish Tower. 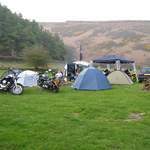 Biker Friendly Campsites, Camping, Devon, Padstow, Woolacombe and Lundy Island to the West, Lee Bay and Ilfracombe to the North and the South Coast of Wales, in the coastal preservation area of North Devon. In a region with so much to do, whether it be a gentle stroll around the harbour at Lynmouth, the cobbled roads of Appledore or wandering down the narrow streets of Clovelly, exploring Hartland Abbey & Gardens and Watermouth Castle or a highly recommended ride through Exmoor National Park.camping pods, England, bikers welcome, Bude and Widemouth Bay. easy traveling distance of a few nice towns and villages and ideally situated to explore Devon and Cornwall, within easy reach of both Exmoor and Dartmoor National parks and the coastal resorts of Bude, Tintagel and Padstow.